The art varies from country to country, exhibiting different cultures and religious traditions. 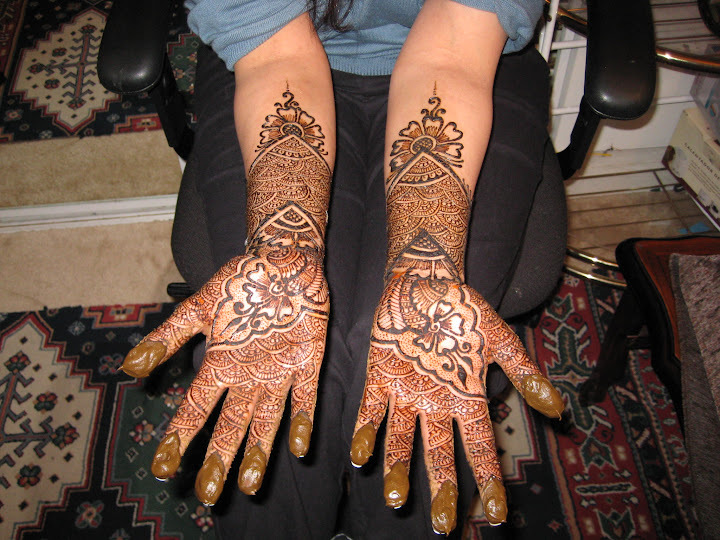 Other culture that use henna prominentaly are Arabs, Africans (North Africans), Asians and Middle Easterns. Henna after care for brides. - As much heat as possible for the first 24 hours even after paste is removed. 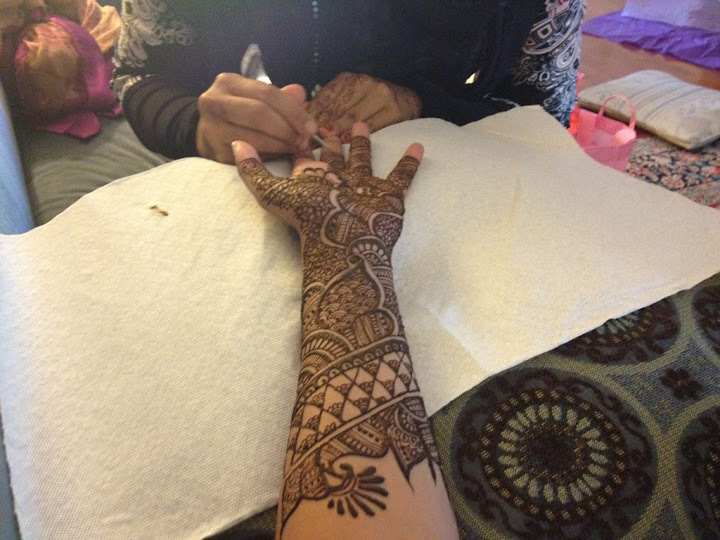 Even when the henna paste is removed, exposure to regular heat will help it to darken. Henna is dark on the upper arm or shin. Darkest colors will be on the toes, fingers and palm. - Do not wash with water for 24 hours if possible. Pick or scrape the paste off after 8 hours. If paste falls off earlier, don't panic. It's done it's job. Just don't help it along by picking. - Leave paste on for a minimum of 4 hours and leaving it overnight is eventually the best. - Design will progress from orange tones to marron or brown depending on the person in about 48 hours and will get darker with time. - No exfoliants (chlorine, most hand lotions) No pools or hot tubs, No anti-oxodents such as found in many face lotions and hand lotions. - To prevent the design from fading away soon, protect it during water contact by using natural oils, such as olive or corn. 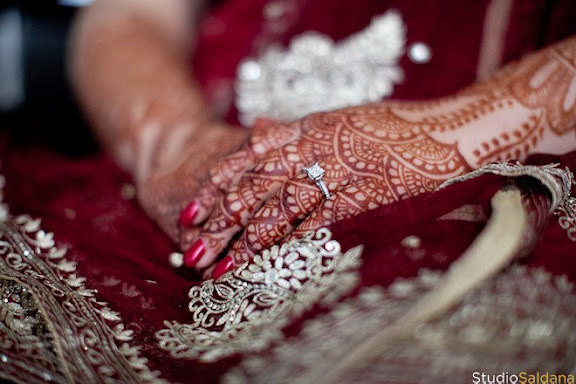 A latex glove with an elastic band at the wrist is helpful to protect hand mehndi when showering. Some wax based balms are also helpful to make water bead away from the design. No wax balms with exfoliating properties or anti-oxidants should be used. - When tanning, please keep in mind that areas recently hennaed are 'sun screened' and will not tan. A 'ghosting' effect may occur where un-hennaed skin will tan and the pattern will not. - Ensure that pedicure/manicure is done the day or morning before the henna day, if possible. If done after, the massage and oils must be skipped or it could interfere with color progression. Oil applications the morning of the henna day may also interfere with application. Make sure they only do your nails and not the oil on your skin. - Leg waxing/sugaring or shaving should be done 1 or two days before henna and not after henna is applied. This will impede the color. - If you are participating in the Haldi/Tumeric ceremony after henna application, attempt to wear gloves or socks so that the henna does not get scrubbed. 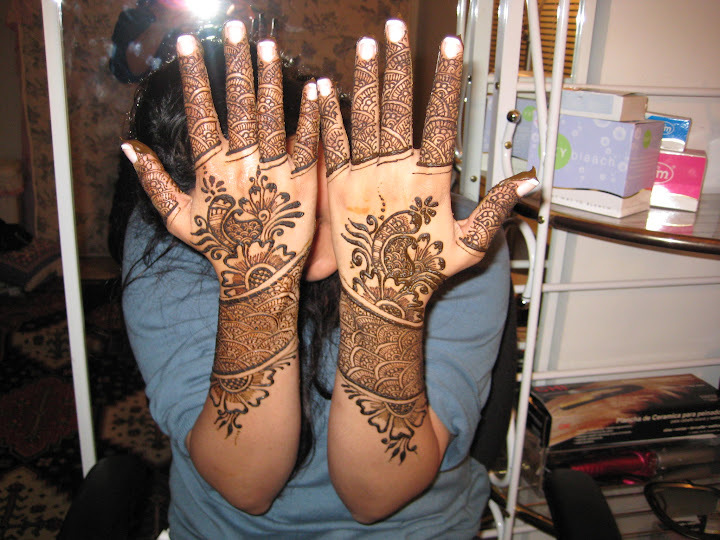 This could affect the color greatly if the henna is scrubbed or washed. - Please remember to use your gloves (latex or otherwise waterproof) when touching water for bathing or washing whenever possible for at least the first 24- 48 hours. - Before application, ensure you are wearing comfortable clothes you can sleep in and remove your contacts if you wear them as you will be unable to remove them once your henna is applied.